Who says politicians don't have a sense of humor? 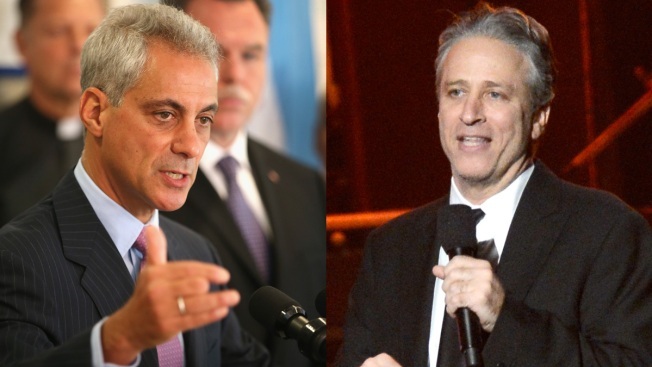 Chicago Mayor Rahm Emanuel issued a classic comeback in response to "The Daily Show" funnyman Jon Stewart's rant against his home city-- which included several critical remarks about deep-dish pizza -- by sending the talk show host a couple of said pizzas loaded with anchovies. The pizzas included a note which read "Jon, Deep Dish With Dead Fish, Love, Rahm," and a tweet saying "No hard feelings?" Stewart began his anti-Chicago diatribe on Wednesday night's show by referencing Rahm's reaction to the decision to list New York's Freedom Tower as taller than the Willis Tower, and the controversy over whether the WTC building's antenna should be considered part of the structure. Rahm said this week "if it looks like an antenna, acts like an antenna, then guess what? It is an antenna." Rahm's "dead fish" reference harkens back to the days when the brash former congressman and White House chief of staff sent a dead fish in a box to a pollster who was late with results. But Stewart didn't stop there, also referencing Chicago's high murder rate and for good measure -- hot dogs. Stewart wasn't going to let Rahm get the last laugh, and thanked him by posting a Vine video on the @TheDailyShow Twitter account, showing a dog refusing to eat the deep dish pizza. Chances are, if this was the Rahm of say, 30 years ago, this battle may have been over in a New York minute.